I have been very busy creatively, but the work is slow: I have to wait for glue to dry or paint to dry or I need to step back and think. Then a flurry of activity before I pause to wait for glue to dry or paint to dry or I have to step back and think. My ogre/faerie house is coming along. I moved the details on that to my artsy blog to detail the progress: Two Crow Feather Woman. I can cheat a little tonight and spill the beans on some of it on this blog – which is supposed to be for other aspects of my life, like hunting for cryptids, gardening, birdwatching and spilling the beans about great Goodwill finds. I spent some time at Goodwill today. 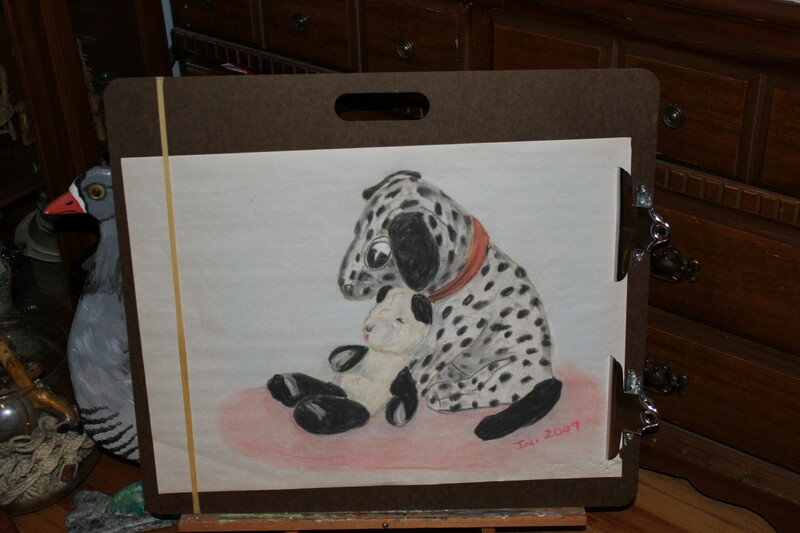 Not the drawing – the clipboard. It’s about 2×2′ (.6x.6 meters). It is made specifically to hold down large paper as demonstrated. The large rubber band keeps the paper from flapping & the two clips – well, they hold the paper in place. The handle is an additional bonus. There were two such beauties at the local Goodwill store. I’ve only seen these for sale at regular art stores and they were always more money than I had jingling in my pocket at the time. I found one here for $42. I paid $3.99 at Goodwill. I left the other one there for another “starving” artist to find. We’re divided on this item. 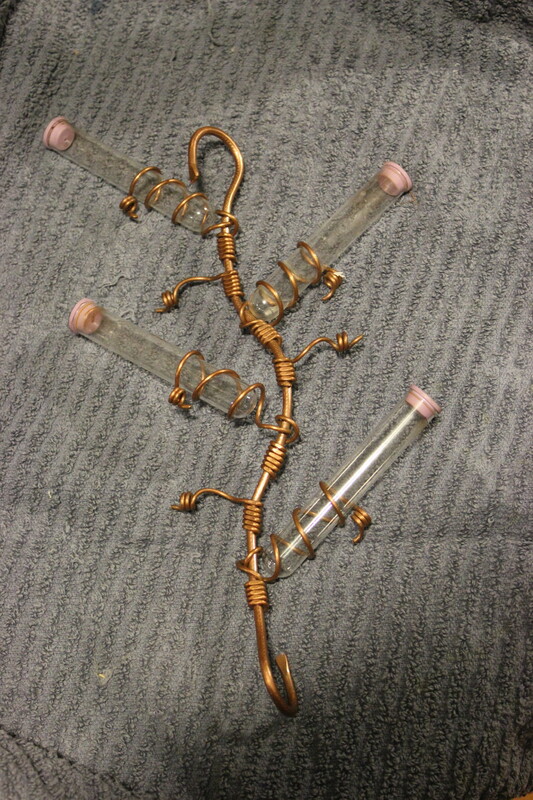 My husband thinks it is for flowers and I think it is a funky hummingbird feeder. I’ll clean it with a bleach solution (1 part bleach to 10 parts water) and then I am going to fill it with homemade hummingbird nectar (boil 1 C water for 2 minutes, stir in 1/4 C sugar and cool). Then I will keep an eye on it to see if my resident Anna’s Hummingbirds use it or not. If they don’t, I’ll trash that idea and the test tubes. The copper wire is artsy enough for me. In fact, the copper wire is the value: $2.99 and I probably paid just for the wire. DANG! 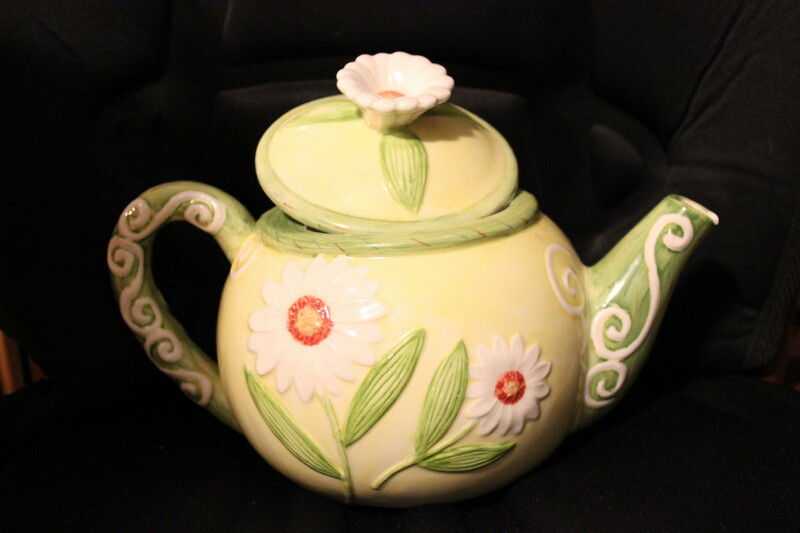 I saw this ugly tea pot and I *knew* it has a faerie that lives inside of it. I will set it aside and let the idea steep for awhile. Now this was an unexpected find. 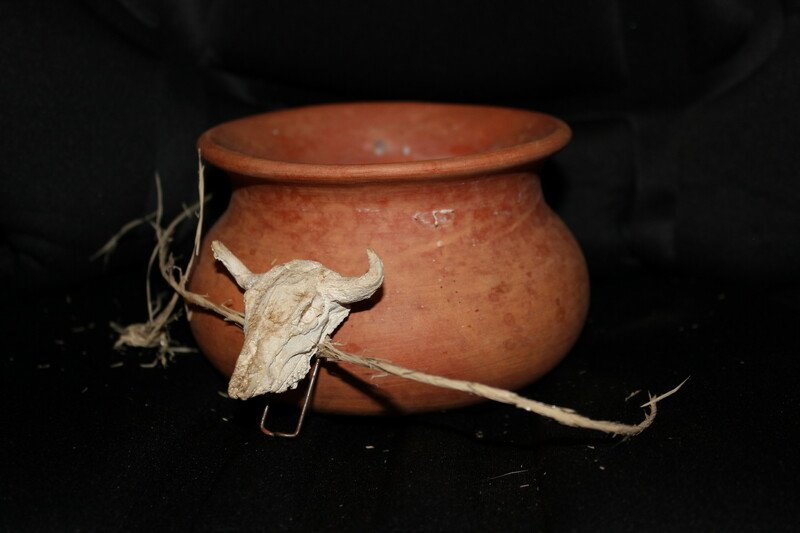 I really just wanted the cow skull, but it was (before I picked it up and the hemp shredded) attached to the terra cotta planter. 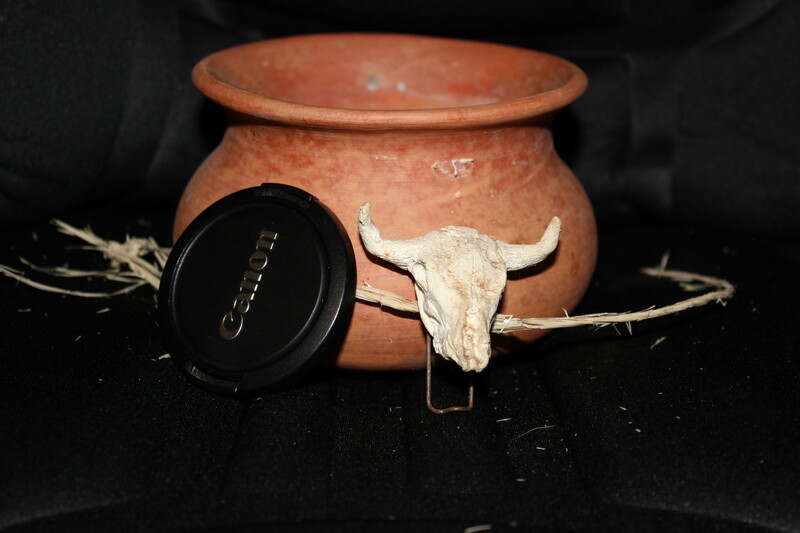 The planter I could live without (I have a potting shed full of planters), but that cow skull! I put my lens cap into the photo to give you an idea of the size of it. 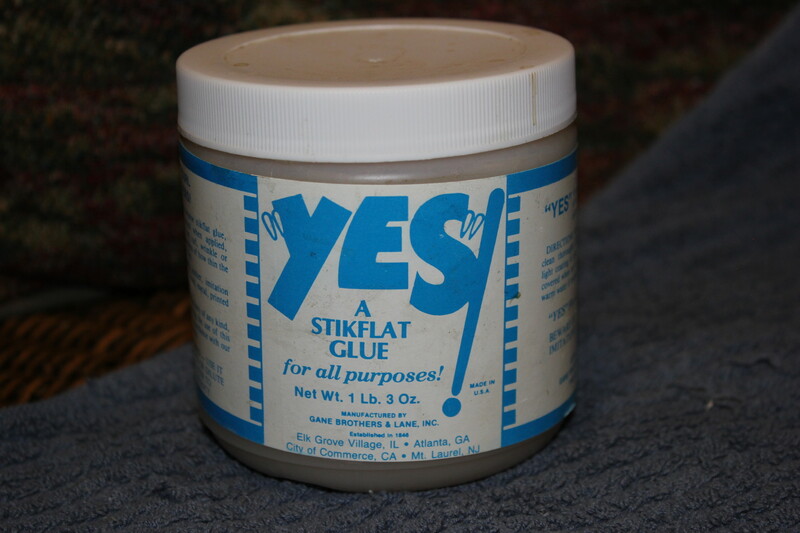 Oh, heck yeah – I can find new life for that critter. I didn’t buy this at Goodwill today. I found it at an Estate Sale. I’d never seen it before but I got it in a bulk of items I paid $5.00 for. This little pint goes for $13.50 at craft or art stores – and it lasts forever. I didn’t start using it until I started work on the owl faerie tree house and now I am sold on it. I have no idea what the ingredients are, but it is water soluble and holds really well. 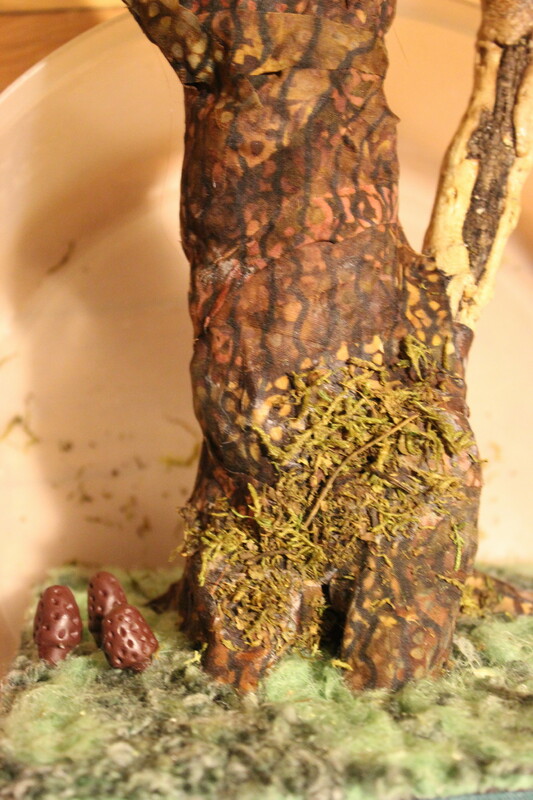 I used it to glue the yarn down on the base of the tree, to glue the tiny Morel Mushrooms to the yarn, and to glue the moss onto the side of the tree. I have more moss to attach and am waiting for the glue to dry. Did I mention I am doing a lot of waiting for flue to dry right now? 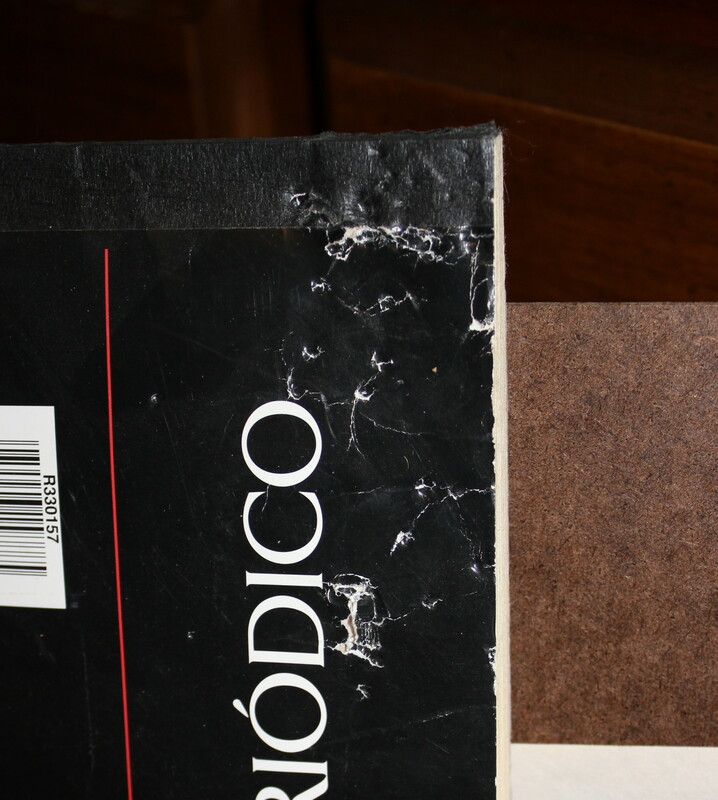 When I started taking photos tonight, I noticed that my pastel sketch book had tooth marks in it. Hmmm. I don’t remember Harvey chewing on things. He doesn’t chew on things. Then I remembered: he got locked up in the loft when I was on vacation. I know this because he chewed on the doggy gate. He chewed on a lot of things when we were on vacation and he was Left Behind.